A reported 7,000 men attempted to enlist for deployment at Sydney’s Victoria Barracks during the first week of Australia’s involvement in the First World War, more than triple the amount currently on deployment (2,400) throughout the world from the Australian Defence Force. What's more remarkable is that figures comes from a time when the population of Australia was fewer than 5 million people. Australia's current population is a little over 25 million. Of course, while the numbers are there, you can't really compare deployment figures a century apart, be that because of the dramatic difference in world affairs or the shift in key motivators for participation in the armed forces. It's interesting to analyse the latter and see the differences, if there are any, in motivation that recruits have when they join the armed forces in this day and age. Over the course of WWI, 416,809 men enlisted (38.7 per cent of the male population aged between 18 and 44), of which 60,000 tragically lost their lives. It remains the costliest conflict for Australia in terms of deaths and casualties. Those figures alone are part of the reason why the idea of 'adventure' quickly dissipated for the men serving in the Australian Imperial Force, despite what they'd been sold by recruiters and propaganda posters. Dr Aaron Pegram, senior historian in military history at the Australian War Memorial, points out that the promised epic journey proved to be anything but. "Once the fighting gets underway in Gallipoli, that sense of adventure very quickly becomes not so appealing. Australians could see the names of the casualties printed in local news, and that spirit of adventure sapped quickly," Dr Pegram said. "As well as the realisation that the war wouldn't be over by Christmas as the British had published in their media." Dr Pegram explained that recruiting was a "direct appeal" to Australian masculinity, telling people to enlist with their mates, serve overseas together and do something with their lives. However, the recruitment drives may be less sinister than they appear, due to the fact that no one really knew what to expect from a conflict of this size. "No senior commander worth his salt could have predicted the conditions on the Western Front and Gallipoli would be bogged down into one of stalemate," said Dr Pegram. The infantry of the time was set up for a mobile war, like what had been seen in South Africa during the Boer War, and Dr Pegram said the British (and by extension Australians) had to undergo training on-the-go on how to fight in siege-like conditions. Considering the empty promises and horrors that servicemen endured during WWI, it would be reasonable to think enlistment numbers for the Second World War would drop. However, a total of 990,900 people enlisted for service, with 557,799 of those deployed outside Australia. That's over 100,000 more than the enlistment numbers for the First World War. This isn't just because the promise of adventure captured Australians looking to serve, but many other key factors also played a part. On 6 August 1914, The Sydney Morning Herald's front page read: "For good or ill, we are engaged with the mother country in fighting for liberty and peace." Australians at the time were extremely loyal to Britain, and as Dr Pegram said, "may have seen themselves as British first and Australian second". There were many ties with Great Britain, with over 20 per cent of the nation's population born in the UK. Germany invading Belgium also captured the attention of Australians, who were inspired to come to the defence of the small country. Another, perhaps overlooked, motivator was the financial gain that could be made by joining the Imperial Force. Australians were paid handsomely for the time, at 6 shillings a day. British soldiers earned just 1 shilling a day, and with the country still crawling out of a depression period, a small fortune could be made by enlisting. Six shillings per day roughly equates to about $35 a day, according to the Reserve Bank of Australia. It was also seen as a genuine career choice for those not in stable jobs, or who were unskilled labourers during that time period. The majority of these motivators seem to have passed on to the next generation, who were the main servicemen in WWII, but with the added "shadow of the Great War" hanging over them. By the time Germany invaded Poland in 1939, Anzac traditions had well and truly been established in Australian society, as well as the legends formed during WWI. One of these is "Simpson and his donkey", a stretcher bearer for the 1st Australian Division at Gallipoli, John Simpson Kirkpatrick, who used donkeys to transport wounded soldiers while he was often under fire. Simpson grew in legend following the publication of Glorious Deeds of Australasians in the Great War in 1915, which was a propaganda novel that told the story of the Anzac legend, perhaps with too much poetic license. Regardless, these stories became a part of Australian folklore, and inspired many young men to try and create their own legacies. Another significant difference between the two wars, and a concern that hasn't been relevant in some time, is the immediate threat to their own country. With the outbreak of the Pacific War, and Japan island-hopping towards the continent, the threat of invasion was extremely well-founded. Repeated failures by the British to adequately prepare for the ferocity of the Japanese invasion through south-east Asia culminated in a number of military disasters that placed the nation in an increasingly precarious position. The fall of Singapore in 1942, the utter annihilation of the hastily organised Force Z taskforce of the Royal Navy quickly established the capacity of the Japanese, and not only the ineptitude of British commanders, but also the limitation of the mother country. Japanese midget submarines entering Sydney Harbour, as well as northern cities being bombed by the Imperial Air Force, meant the country was under attack for the first time as a Commonwealth nation. This feeling of vulnerability "certainly does motivate" enlistment, according to Dr Pegram. So despite this "mixed bag" of reasons to join the armed forces, one that didn't feature heavily was the notion of being a soldier for life. 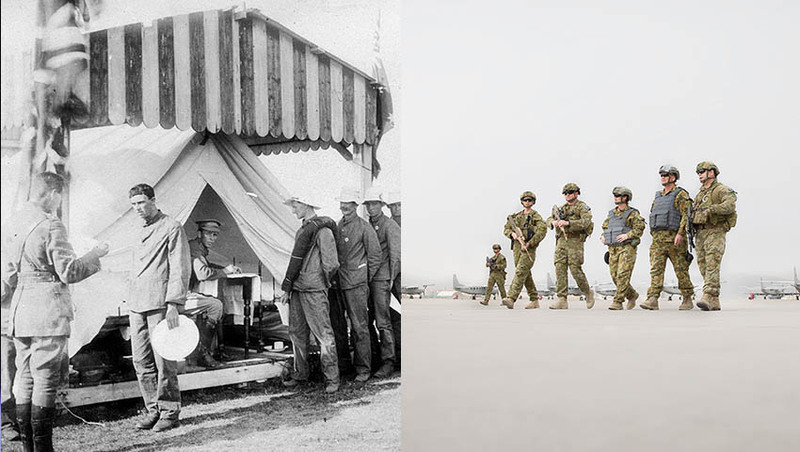 Career defence personnel were few and far between, and this doesn't particularly become commonplace until post-WWII, when the Australian Army decided to establish a permanent field force of 19,000, straying away from the citizen force method that had seen the country through both World Wars. However, one that also still lives on is the desire to serve the country. Director General for Defence Force recruiting Air Commodore Sue McGready joined Defence Connect in September for a podcast, and spoke about that motivation for the 80,000 odd candidates who apply each year for the ADF. "I find a lot of people are attracted to Defence because of an innate desire to serve. To serve their country and to provide service to others. That again, is a great quality to have," AIRCDRE McGready said. She also elaborated on the "career-choice" pathway that many Australians are choosing to take by enlisting. "When we talk about the future of work, what we hear is the next generation wants to have five different careers and 30 different jobs in their lifetime. Some people look at Defence and say, well, that's just one job. But it's not. Every two years or even less in Defence, I've been given a new job, and all of them challenging. I don't believe in there is such a thing as a bad posting because you can make anything out of anything," AIRCDRE McGready said.